1) Rand never defined ethics as how we interact with out family members. She defined ethics as "a code of values to define men's choices and actions. Her adoption of selfishness, then, was at least partially motivated by political concerns. A morality founded on the need to defend a particular political or economic arrangement is bound to lead to problems. “I am not primarily an advocate of capitalism,” she wrote in 1971, “but of egoism; and I am not primarily an advocate of egoism, but of reason." Her point was that politics doesn't arise out of nothing, but from the views that people explicitly or tacitly accept. Now, I know your book addresses this by saying that governments aren't created from adherence to explicit moral principles. You're right. But this is not what Rand meant. Politicians, today as always, make empty overtures to things like "the public good." The reason their schemes get enacted is because voters sympathize those overtures. The politician probably could not care less about the public good; he just wants to be elected. The public, however, hears such phrases and thinks, "Well, how can you go wrong with that?" Rand applied a broader theory of rational egoism to politics to challenge exactly this. She theorized that if people consciously thought about the altruistic justifications politicians use, they would cease being effective. However, Rand did not invent this simply to fight a political battle. She wrote extensively about applying that same active-minded, self-interested theory to your personal affairs. It's not as though she glossed over the personal details to get to her real project of capitalist rhetoric. Capitalism was simply a natural outgrowth of living for yourself. "Rand never defined ethics as how we interact with our family members." Since Rand believed in a vacuum of force in personal relations, her view of the state cannot be considered a macrocosm for her view of personal relations. She wanted government to wield force to protect the good, who cannot maintain their morality if they are forced into the zero-sum game of force. 1) Of course Rand never defined ethics as how we interact without family members. But because people behave differently toward family members than they would if they were governing, legislating, a judiciating for the state, it would have been better if she had. She is in sense implicitly claiming that, ethically speaking, one size fits all — and it most manifestly doesn't! 2) Rand may not have adopted her views to denounce the left, but she was very much influenced by the example of the Left (and the statist, liberal center) when she was developing her political and moral ideas in the forties and fifties. In 1940 Rand campaigned for Wilkie in the Presidential election. She got no where arguing politics with people, and concluded that it was futile to try to change things by arguing about politics. But she did not conclude that arguing in general was futile. Because she constantly heard was hearing left-leaning intellectuals denouncing capitalism because it was based on the profit-motive, she decided that the only way to defend capitalism was to embrace the profit-motive and to declare, as she did in Atlas, that greed was good. "However, Rand did not invent this simply to fight a political battle. She wrote extensively about applying that same active-minded, self-interested theory to your personal affairs. " Yes, but her failure to make the distinction between the political and the personal caused her to muddle the whole issue. If you are trying to convince people to accept capitalism, telling them that (1) They should be selfish in the politico-economic realm because "greed is good" and (2) that they should also be selfish in the personal realm is not a very effective way of going about the art of persuasion. Rand will always be misunderstood by most people on this issue, because she's flouting common usuge. In terms of what people actually mean by the term, it is not selfish to buy one's wife a car. Nor does it help to redefine sacrifice as giving up a greater for a lesser value, particularly when the underlying implication is that selfishness is merely pursuing what you really value (or really "objectively" value). You're going to have a hard time selling people on an argument based on redefining words in confusing ways and than dodging the whole issue on what people should really be valuing by saying they, whatever they "objectively" value, that's what they should pursue. Now what I am suggesting is that all this confusion on Rand's part (flouting common usuge, implying that selfishness is pursuing what you really value) could have been easily avoided merely by making a distinction between the personal and the political, the micro and the macro. The state cannot be run as if it were a parent and all citizens its children, as the altruistic and humanitarian sentimentalists on the Left would like! The nuturant model of parenting, which the progressive sentimentalist George Lakoff so admires, is not applicable to politics! By denying the viability of the parenting model of the state, Rand could have devised a moral defense of capitalism that did not involve pumping for selfishness—which is almost as bad as defending capitalism on the basis of altruism. G. Saad: "Since Rand believed in a vacuum of force in personal relations, her view of the state cannot be considered a macrocosm for her view of personal relations. She wanted government to wield force to protect the good, who cannot maintain their morality if they are forced into the zero-sum game of force." Yes, that's true on that one issue; but it's not true overall. Rand preaches a general selfishness in both realms, which leads her to such difficulties as trying to explain why caring about loved ones is selfish—a very hard sell given the common usuge definition of selfish. Her attempt to redefine selfishness to include inter-personal interests also makes it difficult to distinguish between selfish and altruistic interests. She is forced to define altruism in terms of prefering the lesser value—a very controversial definition which would strike most non-Objectivists as inaccurate and unfair. I agree that it's not easy to win arguments that way, but the common idea of selfishness is wrong. Isn't it just dancing around the issue at hand to concede "Yes, selfishness is mindlessly indulging your immediate whims" when in fact that's not the case? Winning arguments is one thing, but as you said in your book, the ability to defend a position in argument says little about its truth or falsehood. I'm interested in the truth, not adhering to common and flawed definitions of words. Also - I may be wrong, but let's say Rand did deny the parenting model of government. Doesn't that denial implicitly say that people should be deciding how to live their own lives; ie, living for themselves? Maybe I misunderstood you, but it seems like she gets to pretty much the same place. Most would not only find it inaccurate and unfair, but also absurd. If someone really believed that X was of lesser value then Y, why would someone believe that he should sacrifice Y for X? Back to the starving child verses buying a hat example mentioned in an earlier blog entry. If the mother really didn't regard feeding her child as more important then buying the hat, why would she think she should sacrifice having the hat to keep her child alive? I also read something in Capitalism Magazine saying that a soldier dyeing for the freedom of his country is no sacrifice. Try telling that to his grieving mother. The common definition of any word is the 'real' definition. Words are tools for communication, and in order to use them effectively for that purpose we need to have a common understanding of what they mean, derived from convention. The fact that Rand's definition of selfishness is at variance with that of nearly everyone else means that if anyone is using it in the wrong way then she is! Quite why she insisted on using 'selfishness' as opposed to 'self-interest' to express her ideas beats me but - deliberate or otherwise - the result is confusion. Jay: "Isn't it just dancing around the issue at hand to concede 'Yes, selfishness is mindlessly indulging your immediate whims' when in fact that's not the case? " Mindlessly indulging in immediate whims is not the common usuge definition of selfishness (although such behavior would generally be considered as selfish). Selfishness means, in common parlance, not having consideration (or not having enough consideration) for other people, or caring too much about oneself and not enough about others. Words are not primarily tools of communication, they are tools of cognition. No one could communicate without knowing, themselves, what words mean and imply. Rand wrote at length that we should not derive meanings of words from convention, but from reality. If the two happen to coincide, great. But this does not always happen. >Words are not primarily tools of communication, they are tools of cognition. No one could communicate without knowing, themselves, what words mean and imply. Rand wrote at length that we should not derive meanings of words from convention, but from reality. If the two happen to coincide, great. But this does not always happen. Well we're at the nub of one of those "complexity of Objectivism's confusions" type things here. Primarily, as we've said before, Rand's idea that you should "derive the meanings of words from reality" is a complete fallacy. One does not see a piano and then magically "derive" the word "piano" from it! In fact one is taught the word, from a parent or teacher or book or something. Thus it is a convention. Further, if you decide to go against this convention and call a "piano" what everyone else calls a harpsichord, fine, but there is no logical way to show your meaning is somehow the "true" one, and everyone else's is "false". Sure, Rand talks a wad about the vital importance of "true" and "false" definitions, but she might as well be talking about the vital importance of phlostigon and epicycles to science. They simply do not exist. Rand's claim, like the aforegoing, is literally a Medieval belief. However, there is something interesting that can be rescued from this central Objectivist fallacy, and it is a pity that Rand did not pursue it in an interesting waqy. While words are conventions, and used for communication, they have a function that transcends mere communication, in that what we write or say has content that often supersedes what we mean. But we will leave that for now. there is no logical way to show your meaning is somehow the "true" one, and everyone else's is "false". That's fine when the word in question describes a physical object. However, a word like "selfish" describes an attitude or a set of priorities. In cases like that, we have to look at reality and decide "Does what people associate with this word accord with what it logically means?" To answer that question, we have to look at man himself. Men, unlike animals, have conceptual faculties that let us see more than 5 minutes in front of us. We can and must estimate what impact our choices will have on us today, tomorrow, next week. Some may repress these integrations, sure, but the human brain begins making them automatically. And it is an enormous benefit that it does. So, we have established that. Now, if selfishness means concerns with one's own interests, it has to take this into account! A selfish action is one that advances one's own interest, which implies that a broad understanding of one's own interest has been reached. Of course, this still leaves us with people who are selfish in the "common" way. People who take irrational actions to benefit themselves. But there are words that more accurately describe them. If the action really is irrational, why not just call it that? Mindlessly self-indulgent is another. Whimsical is great too, because it implies that the whims being indulged or followed are that person's whims. All of these definitions put the negative connotation on irrationality, mindlessness, and whims, not self-interest. And that's appropriate, because self-interest isn't the problem. It's what those people deem to be in their self-interest that's the problem. That's what I mean by getting definitions from reality. Words do transcend communication, and it would be a shame for someone to denounce self-interest as such because people don't put the flack where it really belongs. >That's fine when the word in question describes a physical object. Aha! Not so fast. Recall that the whole basis of Rand's epistemology begins with perception of physical objects - chairs, tables, etc. It's the first step in "abstracting" into concepts (the formation of which is completed by words), from which we then "abstract from abstractions" to get to "higher level" concepts like "selfishness" etc. Objectivists like to claim that this is how their unique "concepts" are, unlike everyone else's, allegedly "grounded in reality", despite the fact that no Objectivist has ever actually demonstrated a single connection back from an abstract concept such as "selfishness" to a physical object such as a table, chair, atom or whatnot. Not even once! Now, they usually claim that this is because there are so many millions of abstractions involved that it's just to hard to ever actually show (In other words, take it on faith, folks!) Well we don't even have to level this criticism - devastating enough - to undo this argument; for we can see that if there is no logical way of deriving a "true" word from a physical object, there can be no true/false status for the whole subsequent chain of "abstractions from abstractions." This of course, as in ethics, does not mean that words do not refer or pertain to facts - this is a Randian false alternative. It just means that our choice of what words to refer to what facts is up to us, which, if we want to meaningfully communicate rather than have our own private language, then logically this leads to us using conventional meanings. Are you saying, then, that every conventional definition is correct? Just because it's a conventional definition? "History doesn't make something right, consensus is not a fact-based enterprise." >Are you saying, then, that every conventional definition is correct? Of course. There's no such thing as an "incorrect" definition, unless you mean "incorrect" by conventional standards. You have outlined your logic. And I've outlined that 9 times out of 10, the negative connotation from the conventional "selfishness" belongs to things outside self-interest. My contention is that the conventional definition is lagging behind. The people who use selfish in that way are using it as a catchall instead of condemning what they actually find objectionable. But by your logic I should just accept the misguided definition of selfishness, simply because they have decided upon it. 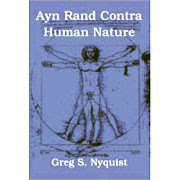 no Objectivist has ever actually demonstrated a single connection back from an abstract concept such as "selfishness" to a physical object such as a table, chair, atom or whatnot. Not even once! This is very interesting to me. If that's true and no one has attempted it, it sounds like a fun research project someday. It's been over 30 years, seems like it's about time to Objectivist epistemology to come out of Beta status! "Words are not primarily tools of communication, they are tools of cognition." I'd like to know what you mean by this, since words and language only exist because of their functional role in communication. But Rand did not endorse evolutionary theory, so I attribute any bad analysis of language to that. "No one could communicate without knowing, themselves, what words mean and imply." But they have to get those words AND their meanings from somewhere. If interpersonal communication did not exist and had never existed, do you think people would actually even have, or come up with, any words? "Rand wrote at length that we should not derive meanings of words from convention, but from reality." The REALITY of the situation is that any particular word has meaning for more than one person BECAUSE of convention. Hence, why not "derive" meaning from convention? To boot, where does this normative statement come from that we shouldn't derive meaning from conventional use? Probably from the false belief that words are not primarily tools of communication. But that is a fact that does not include a normative element. >My contention is that the conventional definition is lagging behind. The people who use selfish in that way are using it as a catchall instead of condemning what they actually find objectionable. But by your logic I should just accept the misguided definition of selfishness, simply because they have decided upon it. No, by my logic you've got any number of options as to how you want to make your point. You might say, for example, self-interest is not the same as selfishness. You might use selfishness, but add qualifications to clarify to others what you mean by the term. You might neologise, and invent "self-fullness" to get at the meaning you want. But you don't get to go, as Rand does, the Objectivist concept of selfishness is only true and valid one, and everyone else's is false and invalid. It's only speculation but yes, I do believe words would be created. Even on a desert island, a person's mind would classify things and he would, over time, come to refer to them by certain names. It would be an arduous task to do alone, but why wouldn't it happen? People need to organize their thinking whether they're communicating with others or not. >It's only speculation but yes, I do believe words would be created. Even on a desert island, a person's mind would classify things and he would, over time, come to refer to them by certain names. Well actually what you've got here is what many Objectivists usually run a mile from: a testable theory. Wow..let me first say how completely fucked up it is how that person was raised and treated. That said..I'm wondering that obvious trauma and lack of changing stimuli had any impact on his development. I can't really speak with any authority on that, but I have to imagine being chained to a bed for 22 years stunts your growth, whether you communicate with people or not. Interesting story though. And tragic. A nonhuman social species known to you, such as meerkats, is fated to evolve into something with the same mental capacities as humans. Given that meerkats don't have concepts (and therefore can't think like us), but rather yelps with general and yelps with specific meanings, consider what happens when the general environment, selection pressures, and mutations conspire to make them evolve brains like ours (and plausibly bodies like ours, but that's beside the point). What happens to the yelps of their ancestors, the meerkats, as this evolution takes place? Surely selfishness has more to do with the values held by a person. At the most basic level, a selfish person is one who places little or no value on the welfare of other people, relative to their own gratification. In contrast an altruist places a very high value on the welfare of others, perhaps even placing it on a par with or above their own welfare. It is interesting that you mention the "Nanny State". I was more under the impression that "Nanny State" was usually used by left leaning individualists to describe the tendency of social conservatives who want to use government initiatives to force people to behave morally and conservatively, like the Moral Majority or Concerned Women of America. I would not really describe the Left as wanting government to play a role in society the way parents to to their children in family. Furthermore, isn't the left all about liberal interpretations of "family", like broadening it to mean gay marriage, single parents, etc and are generally against the idea of only having nuclear families and having family as the building block of society? I guess I do kind of see what you mean by the Left wanting a "nanny state" with welfare and socialized healthcare, but that just wasn't the first thing that came to mind when I think of "nanny state"
Jay mentions that even on a desert island, words would be invented. What is this Objectivist obsession with people, alone, on a desert island? Rand uses it in the beginning of PWNI, with her little astronaut and crashed spaceship story, Gary Hull uses it in the beginning of the lecture series that is, or was, available from ARI's site, it's popped up here on this blog several times in comments, etc. For a philosophy that's supposedly all about "living on earth", it seems to love to use a situation precious few of us are likely to encounterin our lives, thank the gods. You might say, since Objectivism focusses on individuality, it's using this as a stark example, you're by yourself and *must* reason/be productive/Etc. in order to survive. Aside from falling back to the idea of purely physical survival, which Rand seems to violently disavow on all other occasions, it's simply moronic. The simple fact is, we do *not* live on a desert island, we are surrounded by people. This means two things, mainly. In the first place, we must immediately deal with this, we can't just go "how do I, as an individual, apart from all other concerns, wish to behave", at least in matters that can affect these other people. But for me the big thing that's missed is, sorry kids, I hate to burst your Objectivist fantasy bubble, but you're not completely self-sufficient ueberpeople. We depend, at least in America and likely most other developed countries, on all sorts of people for basic necessities like food and clothing. Not just stores to sell it, but drivers to deliver it and so on. We are, in short, in nearly the completely opposite situation, we not only most emphatically do not live on a desert island, but are in fact enmeshed in a web of dependencies for our most basic survival. Please, Objectivists, get over the desert island stupidity. Nobody lives there. Nobody you know has likely been in such a situation. You just look silly, basing your entire philosophy on a hypothetical situation while simultaneously claiming you're the only ones hard-headed enough to handle reality. Not to mention, of course, since we're in this web of dependencies, all of us, even Objectivists, the elitism implied seems ridiculous as well. I am an Objectivist, since I reason and produce and don't succumb to whims and foolishness like wishing I were home or prayers or government handouts, I will be better at surviving than you people who depend on all of these terrible things. But I'll wager Objectivist and non-Objectivist alike, randomly sampled, would have equal facility, or difficulty, building a boat, let's say, or knowing what plants are edible, and so forth. All IMO, of course. What is this Objectivist obsession with people, alone, on a desert island? I can only speak for myself, but the subject here was whether words would evolve without interpersonal communication. The desert island example was the most instructive I could think of. I hate to burst your Objectivist fantasy bubble, but you're not completely self-sufficient ueberpeople. We depend, at least in America and likely most other developed countries, on all sorts of people for basic necessities like food and clothing. These are perfectly acceptable, non-sacrificial relationships. Everyone at each step of this chain chose to do what they are doing. Nothing in Objectivism says "You cannot cooperate with others." Objectivism is not based on a desert island scenario. The point being made is that whether you're alone or among millions, you need to think for yourself and heed reality if you want to live a happy life on your own terms. The only difference is that living the passive life gets you killed on an island. It may not kill you in society, but it may stop you from being independent, successful, or happy. I must warn you though it is very VERY disturbing, I slept with the light on for a few weeks after reading this and cried so much. Children who grow up with no interaction with other human beings are unable to learn language even later in life. Even those who are not confined but grow up in the wild or are raised by wild animals have little if any use of language. Wow, and all this time, I thought Rand opposed statism because it entailed the initiation of force by the government against the individual. I had no idea she was trying to force her personal views on the government. Poor government. Do you think she would approve of the government selfishly coming to your house and beating the crap out of you for opposing Rand's views on individualism? Thanks for clarifying that for us, loon.